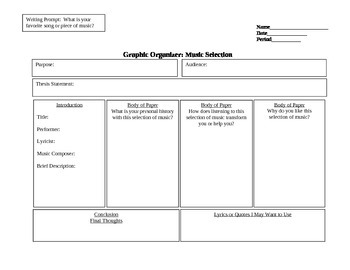 This product is a graphic organizer that is designed to assist students as they plan an essay in which they write about their favorite piece of music or their favorite song. The organizer provides some guided questions that assist them in constructing the body of their essay. The graphic organizer helps middle school, junior high, and high school students frame their thoughts as they work through the writing process. The essay topic is relevant to this age group and is a good beginning-of-the-year writing activity. Students can bring copies of their music selections to share with the class when they have finished their essays.